I enjoyed this post because I have been shopping online for about a year now, trying to decide what is more important to me in a telescope: aperture or portability. Seemingly easy question to decide on, but one that has me see-sawing back and forth between Dobs and catadioptric telescopes. Portability for me is key, but I would hate to have a smaller scope if it resulted in a big reduction in the scope’s versatility. I’d like the scope to last a little while before I upgrade. So my question to you is, what can you see well at 20.5x and 34x with this little scope AND what celestial sights does this scope leave to be desired? FYI, I do binocular astronomy right now, so I have experience with 10x magnification and virtually no other magnifications higher than that. I’m not in an area where I have access to star parties or “loaner scopes” (Peace Corps Volunteer in a rural town in Morocco). Nice site by the way, I enjoy reading it! Hi Jon, thanks for the kind words. I kinda-sorta tackled these questions in the next post, but in case I didn’t sufficiently answer your question: the SV50 excels at sweeping the Milky Way and does a surprisingly respectable job on the brighter clusters, nebulae, and galaxies. That said, a lot of DSOs don’t look like much in it, just little patches of fuzz. I think of the SV50 as a sort of sturdily-mounted superbinocular, in that my observing with it tends to the same sort of best-and-brightest targets, and just cruising around the sky. I haven’t used it much on planets, and I’m not expecting much. Jupiter and Saturn are recognizable but that’s about it. For the moon and planets, the C90 is another league and a 5″-6″ scope is in another league beyond that. Since you already have binoculars, I think something this small would duplicate a lot of your existing capability without adding much. On the CAT vs Dob question, I’d go for a CAT in 3″-4″ range and a Dob at larger sizes, mainly because I don’t dig on figuring out how to mount big telescopes. Dobs come mounted so the work is already done for me. But there is no question that big CATs are a lot more portable than big Dobs (in apertures under 12″, anyway), even with the mount taken into consideration. That’s about all I can say without knowing more about your constraints and desires (i.e., does the scope have to fit into the trunk of your car or the overhead compartment on an airplane, what is the most weight you’re willing to handle, do you do more planetary observing, more deep sky, or both about equally, etc.). Feel free to write back, and good luck with your quest! I’m a college astronomy major who’s been shopping for a telescope for my studies for about a month now and I have a pretty good idea of whats out there, but I’m not sure exactly what scope is going to best meet my needs. 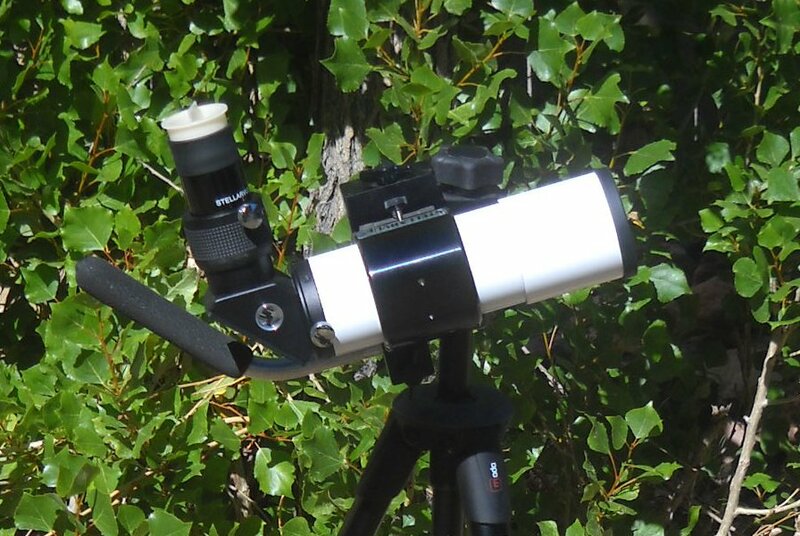 I’ve yet to see anyone with as much hands on experience with small telescopes as you, and I’m hoping you can advise me on the matter so that I can finally get rid of this headache and settle on something to buy. My situation is that I live in the inner city of a moderately light polluted metropolis (Saint Paul, MN) and my best observing site is a semi-dark (still lined by street lights) public park about 3 blocks away. Since I don’t have a car I’m looking for a scope that I can comfortably carry, preferably in a backpack, the 3 blocks to the nearby park then set up and take down quickly. 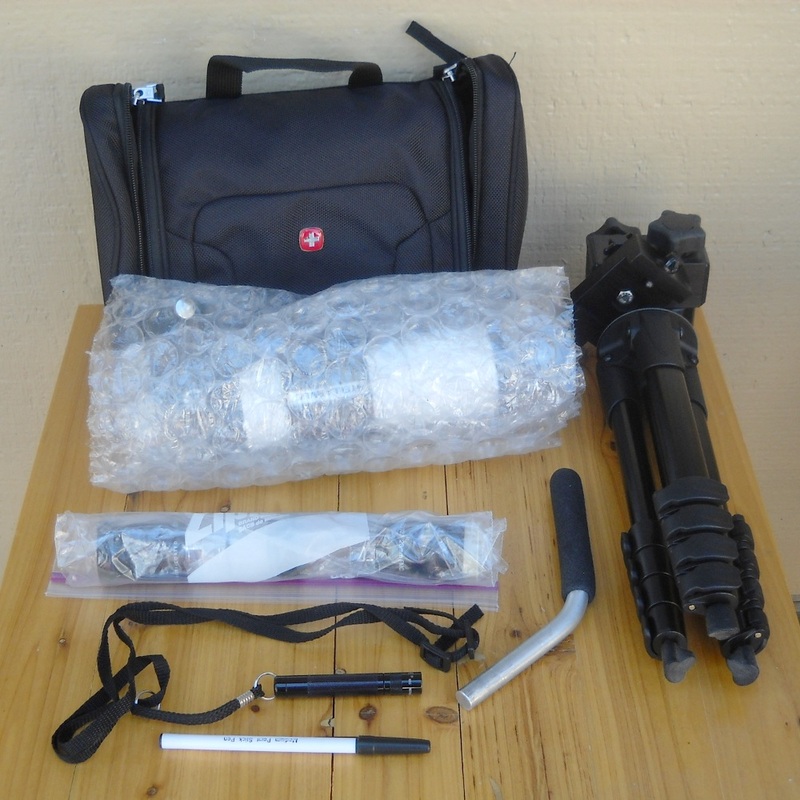 20lbs or less would be ideal for the weight of the telescope & tripod together but I can go a little heavier if needed. The things I would like to be able to observe wiht my telescope are Mars, Saturn, Jupiter, and all 110 of the Messier objects. My budget is somewhat limited being a college student, I’m looking at being able to spend up to $650 or so for the telescope, tripod, and any accessories like additional eye peices or a upgraded finder. So, given your extensive experience with small telescopes, what backpack-able telescope and tripod / accessory combo would you recommend to give me the best views of the planets and Messier Catalogue? I’ve been thinking about the Orion SkyQuest XT4.5 with the addition of a 2x barlow and a 9×50 RACI finder but 17 lbs is still a lot to lug 3 blocks each way when you have to carry it by hand (beccause theres no way that thing is fitting in a backpack), and after reading your blog I can’t help but wonder if maybe there was something smaller and more portable that might still be able to cut through the moderate light pollution of the inner city and show me all the Messier objects and planets. Any suggestions? It depends on how dark your semi-dark site is at the park. I define semi-dark as a suburban sky, which is coded orange on the Bortle scale (may want to look this up online if not familiar with this scale). If you are just able to see the Milky Way band across the sky (cutting through Cygnus and Lyra) with your eyes, then I would consider the sky semi-dark. 5.1 inches (130mm) with 650mm focal length (F/5) is plenty of aperture to see all the Messiers in a semi-dark/suburban sky (and plenty of non-Messier deep sky objects as well). This is a good planetary/deep-sky instrument. Only problem is that it’s a tabletop, you’ll need to find something like a picnic bench to set it on. Also it’s an open tube design, so if you have stray light coming at you from your location, may need to create a shroud for it. 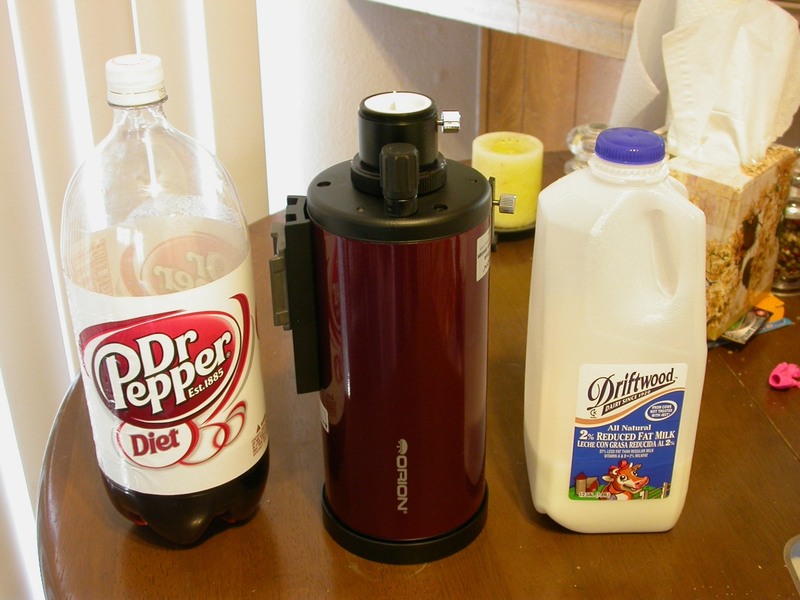 But the collapsed tube easily fits in any standard school backpack, and you can easily carry the tabletop by hand (there’s a handle on the mount). Hope this helps. Sorry to take so long getting back to you, I have been absolutely slammed with teaching lately and it’s not over yet. Terry is the real small-scope-meister and his advice is already very solid. First thing is, with small scopes, aperture definitely wins, especially in town. It comes down to being able to increase image scale AND maintain image brightness, relative to smaller scopes. On your budget, and given the distance you want to walk, that nicely narrows down the possibilities. 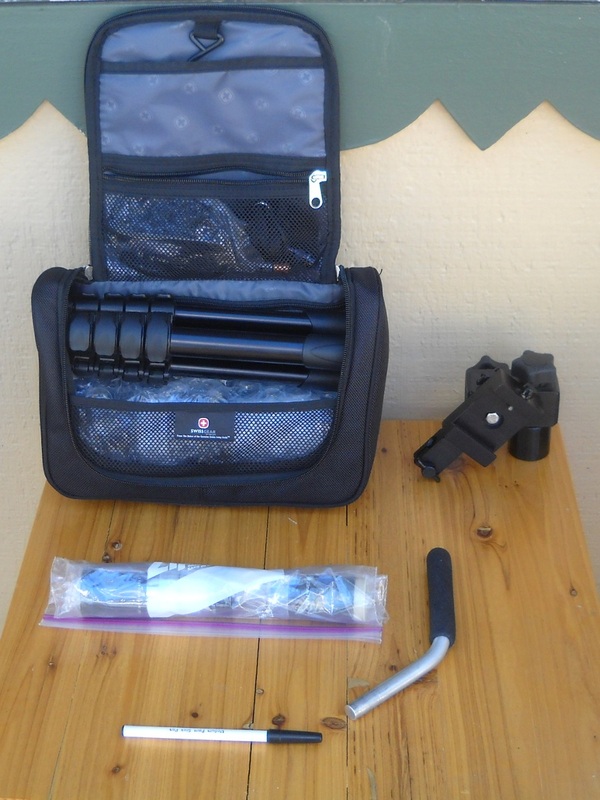 You can immediately abandon refractors–a cheap, backpackable 5″ reflector can be had for well under your budget (leaving some money for a stand and accessories), but a cheap, backpackable 5″ refractor barely exists. The Orion 120ST, I suppose, although it might be pushing the boundaries of “backpackable”, especially with a sturdy mount. 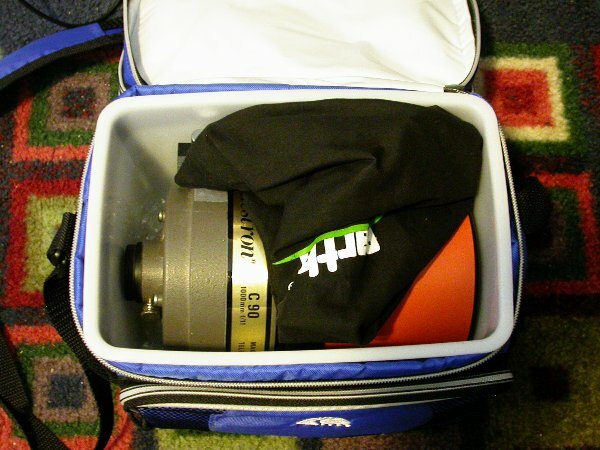 I think Terry nailed it with that 5″ collapsible Dob. 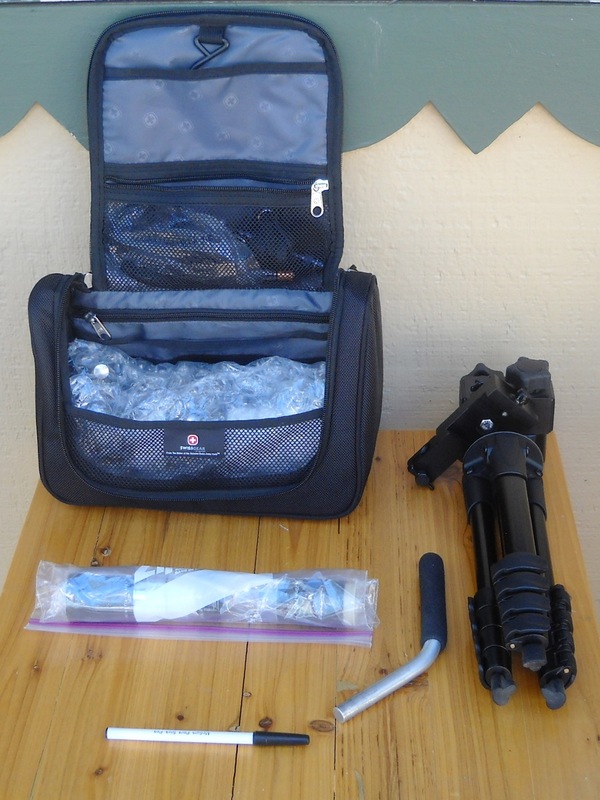 You could put the scope in a backpack and a collapsible table and folding chair in your hands and be set. Or maybe two folding chairs, and just set the scope on one of them. I can think of one other possibility worthy of serious consideration: a 6″ SCT on something like a Vixen Porta mount or Orion VersaGo. I have walked blocks and blocks with my Orion VersaGo II over my shoulder and it was no hardship. 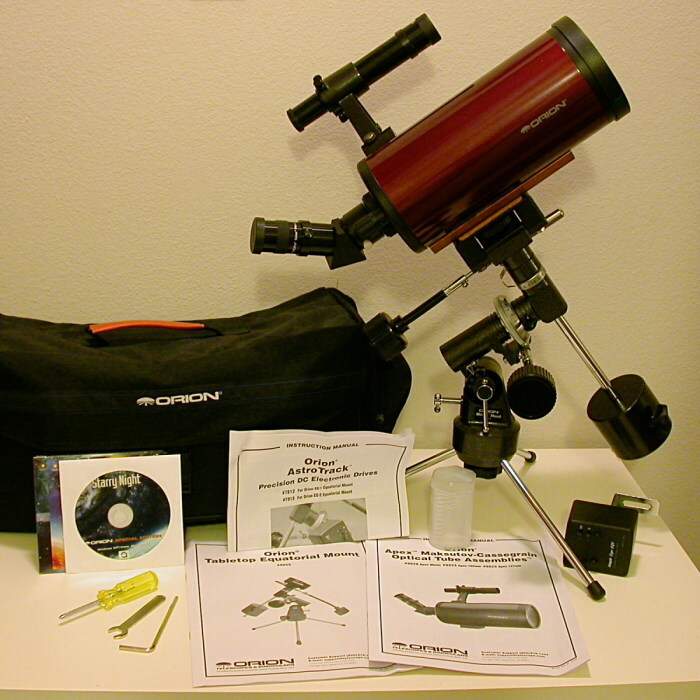 And the Celestron C6 OTA is pretty well-regarded, from everything I can find out. I have seriously considered one myself, and only went for a 5″ Mak because I wanted at least one reasonably capable scope that I would not have to collimate. On your budget, you might have to find a used C6, but they turn up on Cloudy Nights and elsewhere with fair regularity. Flipping back through the older ads will give you an idea of a fair street price. And OPT puts that OTA on sale from time to time. Good luck with your quest–please report back sometime and let us know how things are working out! One more possibility is the Viixen R130sf 5″ Newtonian that OPT now has packaged with the VIxen Porta II mount for $399 w/free shipping. I bought this about 2 months ago and it’s an exemplary package. Razor sharp optics, good light gathering, lightweight, smooth focuser, and the Porta II provides a rock solid base with smooth and precise slo-mo controls, a real asset. I don’t see a much better bang for the buck. 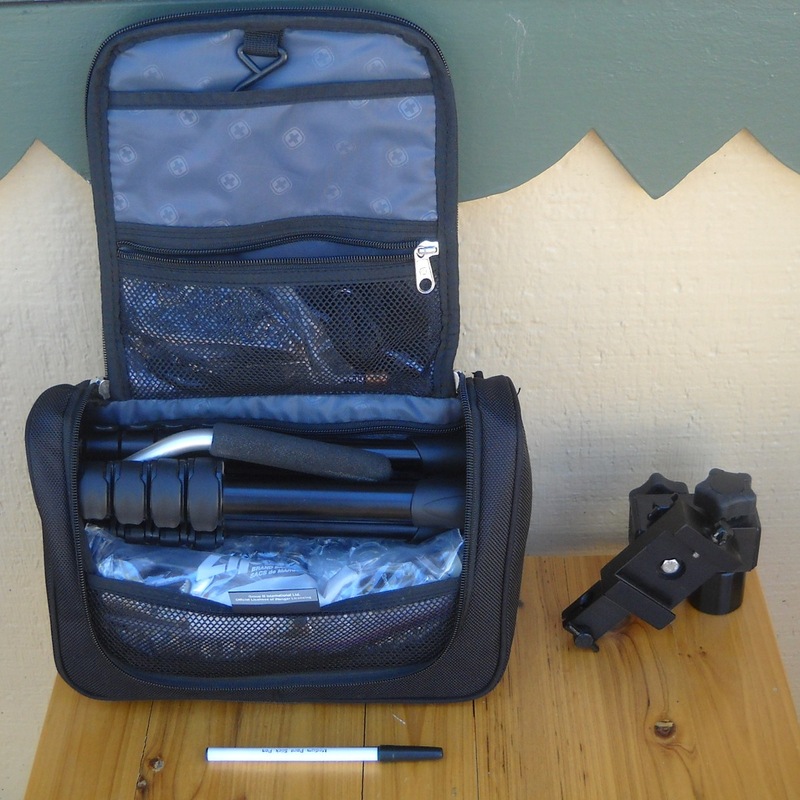 I also bought on ebay a well-padded carry case for the OTA that is a near perfect fit and has a pair of large zippered side pockets to hold your finder and accessories along with a wide mouth dual-zip top opening for easy in-and-out. If you want to the link, I can find it for you. Cost is $34 w/free shipping. The case has both wide shoulder strap and dual handles, so you could carry it on one shoulder, the Porta II on the other, as Matt does, and have a free hand for a small, collapsible chair. Three blocks should be a snap. And you’d no longer require a table or park bench. Best of success in your quest.